About 6 months ago, a good friend of mine in Oregon called to ask if I had ever considered the adhesives I use in my woodworking. I could tell by the pace of the question that he was a bit concerned about it. I told him that for furniture I usually use PVA glue - “why do you ask?” He proceeded to tell me about a conversation with one of the conservators at a pretty well known museum. The conservator said he was amazed by the quality of the fine furniture being made at some of the fine woodworking schools... too bad they rely completely on modern adhesives as the pieces will not last more than 2 generations. It was his opinion that many of these objects will literally fall apart because they rely totally on modern adhesives for their structure. “It is a shame that no one uses hot hide glue anymore”. This prompted a very long conversation. We noted that North Bennett Street school might be the only institution we could think of that still promotes the use of hot hide glue. We talked about the fact that many of us might have visions of our furniture outlasting us - and that our grand-kids will be fighting over it. I know I certainly do. And I think many of the students who have attended any of the fine woodworking schools would feel the same way. We both agreed that we really ought to explore using hot hide glue. Not long after hanging up the phone, I jumped onto youTube to see if there was anything to do with hide glue or hammer veneering. I came across a familiar name - Rob Millard. I have admired Rob’s work for years (I have a bit of a thing for Federal furniture) and seeing his name was like seeing a familiar face at the airport. I watched his 2 part series on hammer veneering. He made it look very straightforward, almost easy (and I know that as soon as someone can make something look easy... they are really good at what they do). So in typical fashion - I jumped in up to my neck. I ordered a glue pot from Joel (tools for working wood). As I was waiting - I decided on the first project. Our sunroom has been mostly done for a few years now. All that was missing were the 3 lift up doors in the upper cabinets. These doors were to hide the “ugly stuff’. 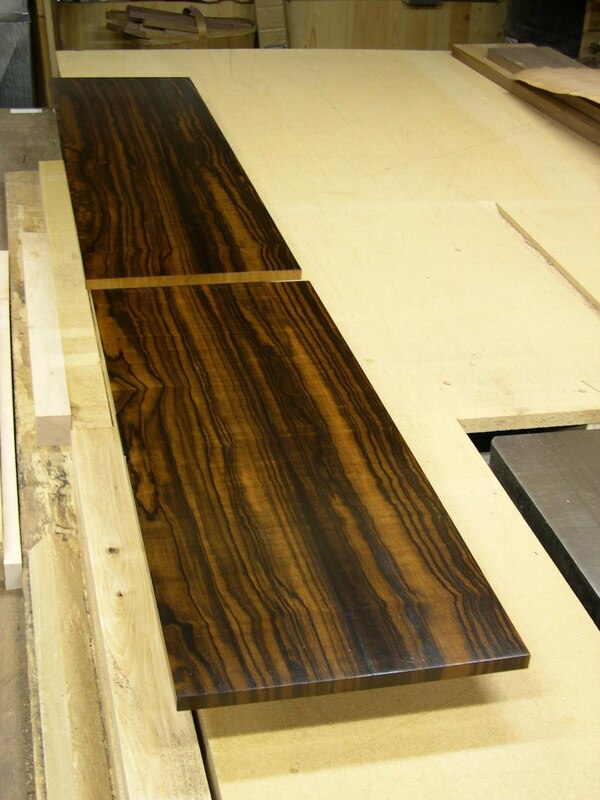 The doors were going to be veneered with Macassar Ebony. What stopped me from making them was the fact that I had a hard time wrapping my head around work with mdf or chipboard. I was not sure how any fasteners were going to hold in any of these materials and to be honest - I cannot stand working with them. 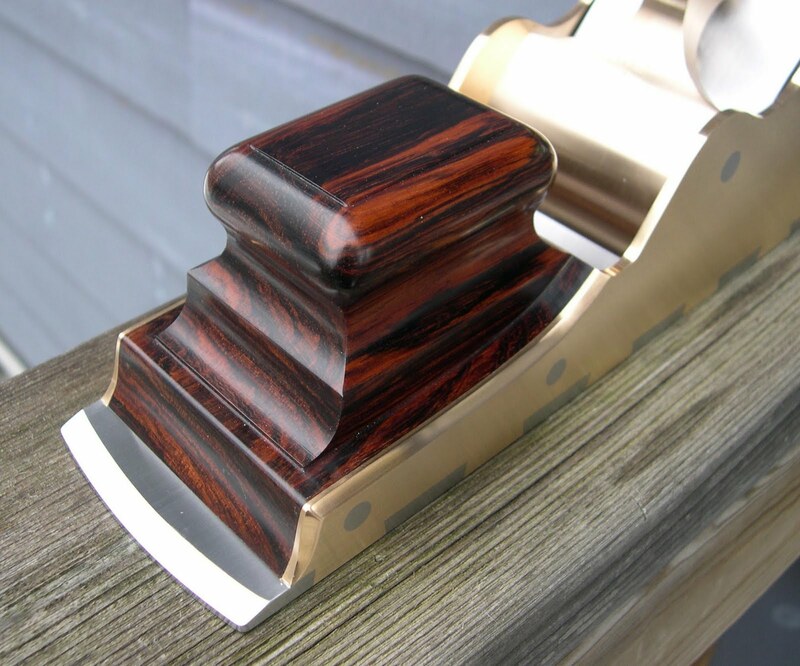 What was so appealing about hammer veneering, was the fact that Rob uses a solid wood core. This instantly appealed to me. I have always collected quarter sawn material whenever I find it. 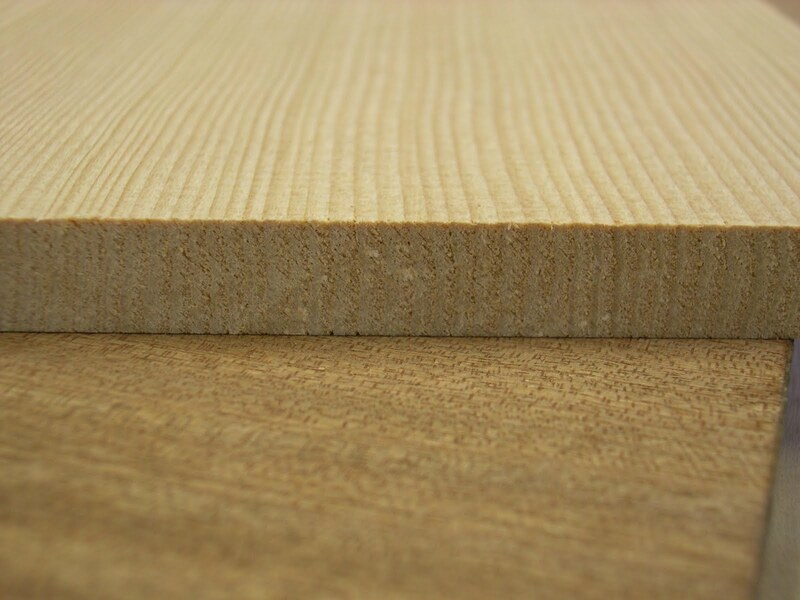 It is perfect for drawer sides and all sorts of other applications. 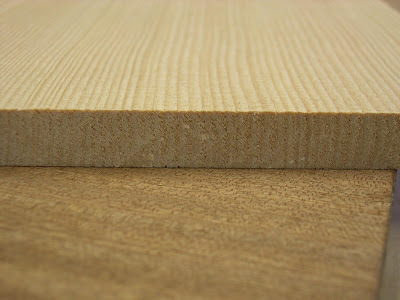 Rob usually uses quarter sawn poplar but he suggested that most any wood would work. I went to Rob’s site to see which of his DVD’s I might get for further instruction. 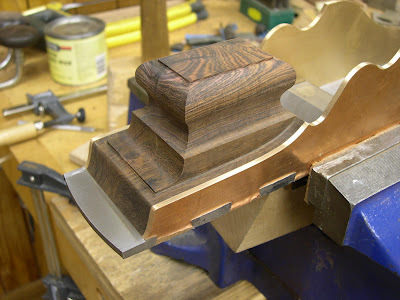 He suggested Making a Federal Inlaid Candlestand. As I was waiting for the glue pot and DVD to arrive, I realized I needed some glue and a veneer hammer. 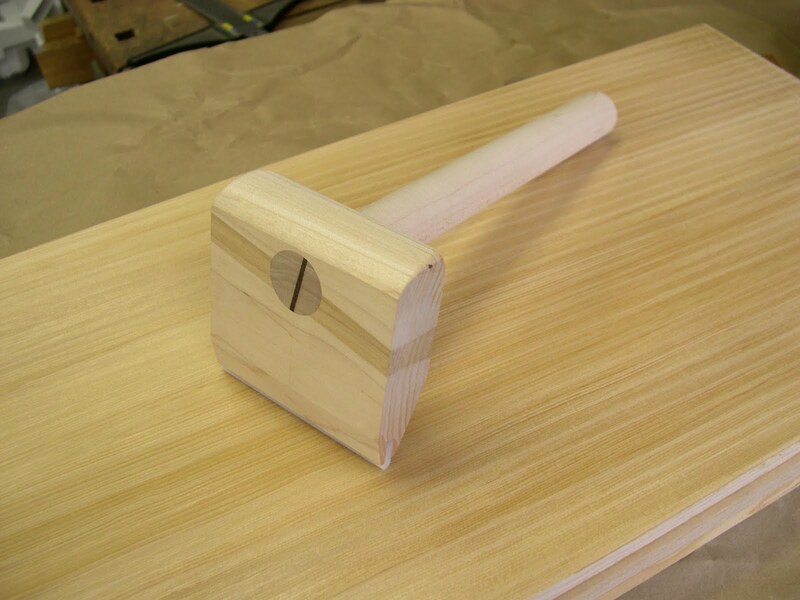 I considered buying a veneer hammer for about 3 seconds and thought making one would be more fun and much faster. Once again I followed Rob’s advise and used a piece of UHMW plastic for the edge. Here is my veneer hammer made from scraps from the Shaker bench restoration. 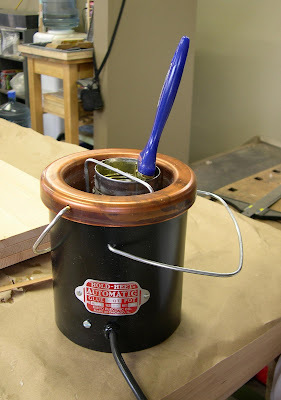 A luthier friend of mine generously donated a bucket (literally) of ground hide glue. Thanks again Mark. Once the pot arrived - I was set to go. 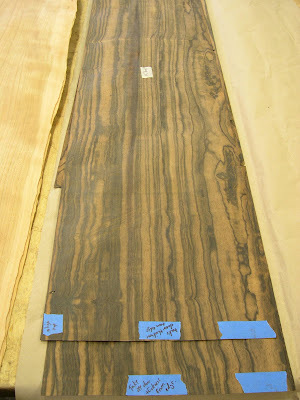 This is the Macassar Ebony veneer. 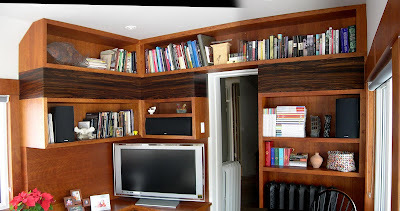 I had already inlayed some of it into the visible ends of the upper cabinets - I wanted the veneer to wrap around the entire built-in. The rest of the sunroom is done in cherry, so it was a no-brainer to veneer cherry onto the insides of the doors. Here is a shot of the quarter sawn core. 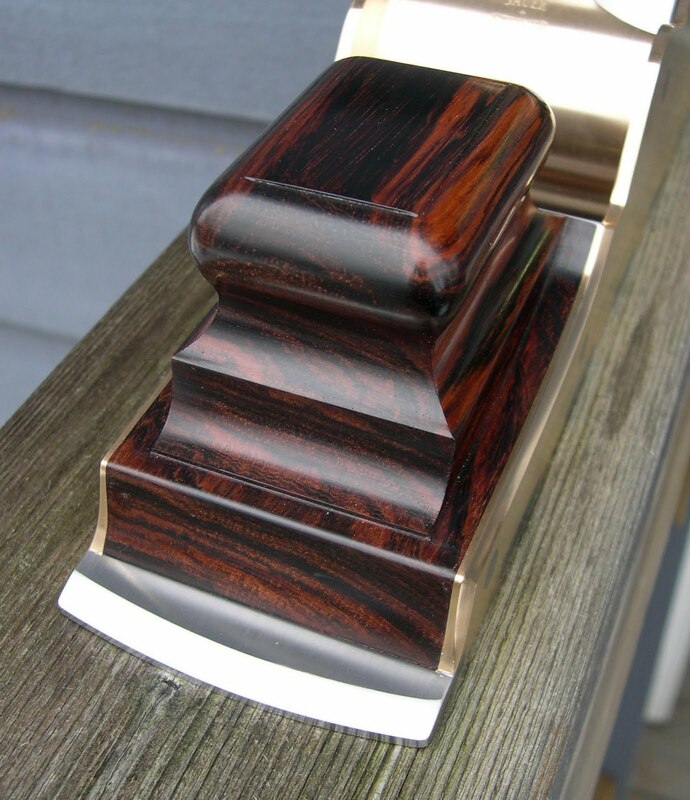 One of the tricks to successful hammer veneering is to use a layer of cross veneer. 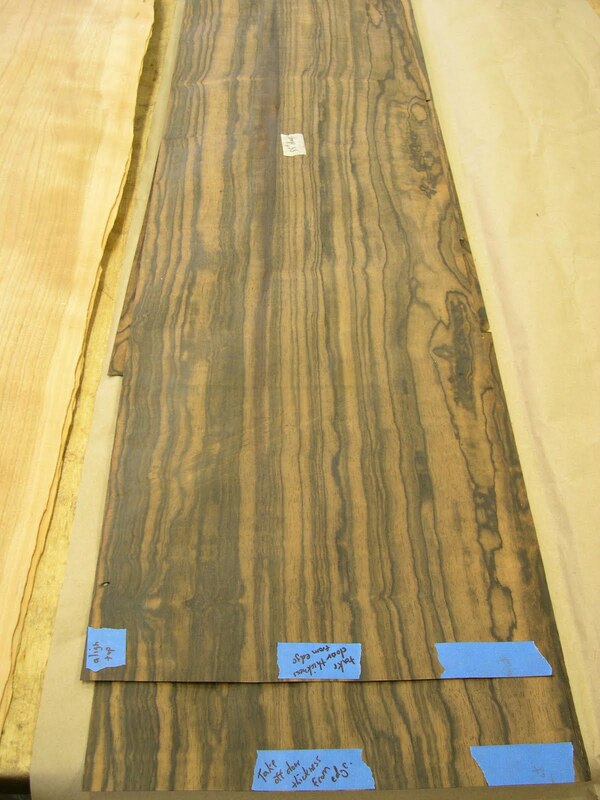 This layer is placed perpendicular to the solid wood core. 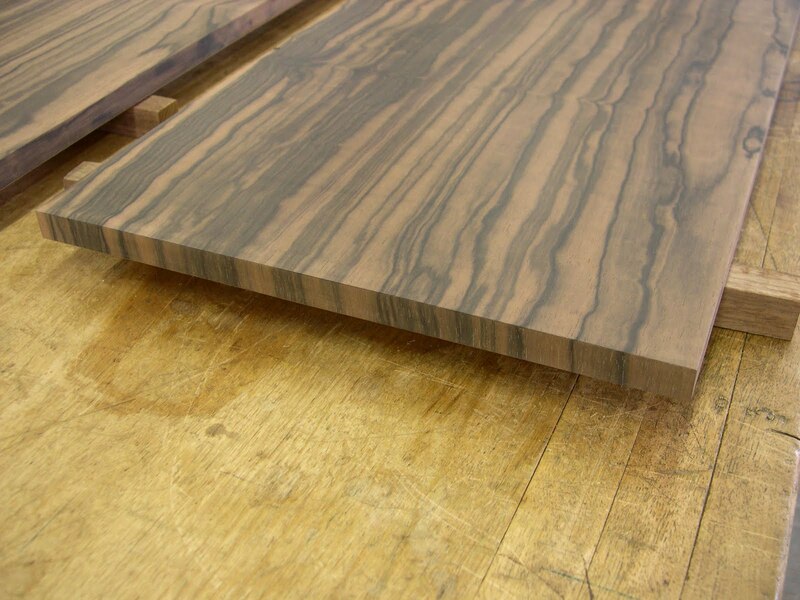 It is also a great opportunity to test out hammer veneering before you use the good veneer. I used some quarter sawn Sapele for the cross veneering. 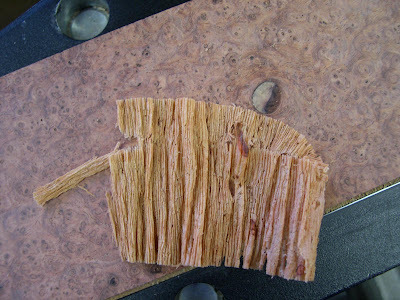 You can see the cross veneer in the above photo as well as the off-cut from the core. 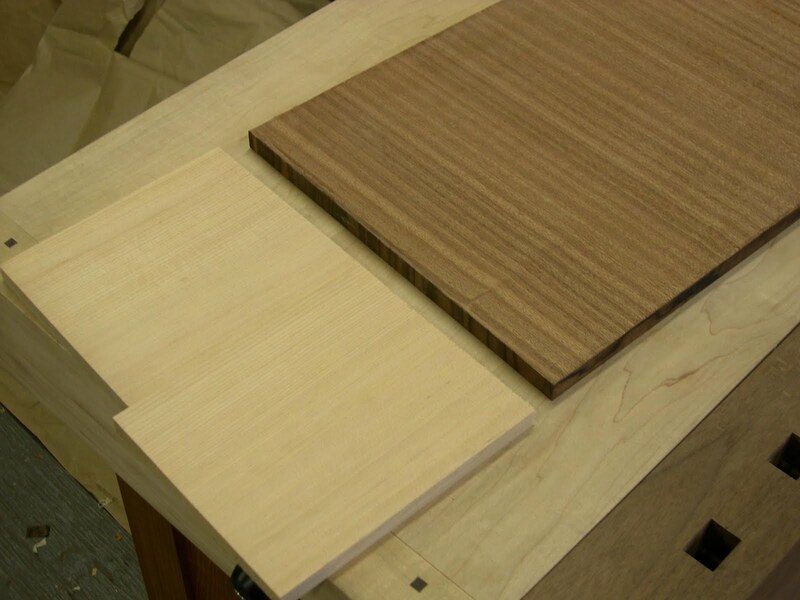 Another critical tip from Rob was to apply a coat of sizing to the flat surfaces and a few coats of sizing to the end grain. This was a great tip as I would have never thought of doing this. It made veneering the edges quite easy. I edged the visible end and bottom edge of the door with some of the Ebony. Two ends showing the face veneer continuing around the corners. 2 of the doors ready for the pulls. Just when I was feeling all proud of how well everything went, I screwed it up in the finishing stage. 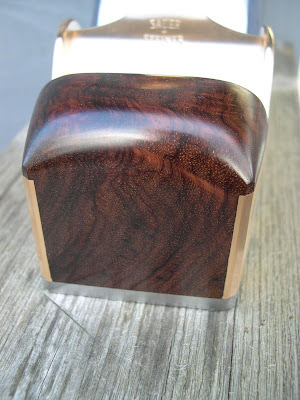 I applied a coat of varnish directly onto the Macassar ebony. Three days later - it was still a bit tacky. I sent a sheepish email to Jameel to see if he had any advise. His response was something to the effect of “dude... I always put a coat of shellac on first! Are you nuts?” I have put finish directly on Rosewoods and ebony many times, but this time it clearly did not work. Thankfully - I was able to remove the finish in less than 10 minutes and I was back to square one without damage to anything but my pride. 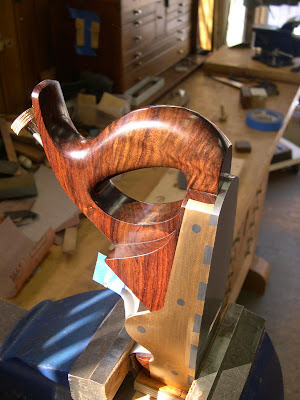 This time I did apply a coat of shellac and the next day, the finish went on perfectly. Our sunroom is quite small so I had to take 2 separate photos and splice them together. The lighting is not ideal, but you can at least see how the doors fit into the cabinets. On the left side you can see how the Macassar wraps around the cabinet. 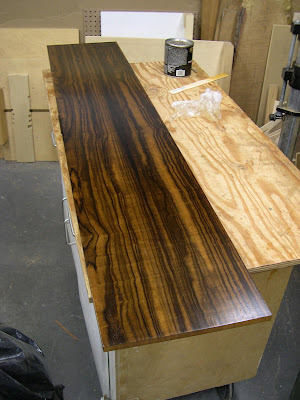 In hindsight - I was kind of an idiot for cutting my (hammer veneering) teeth on 11" wide Macassar Ebony veneer - but it worked wonderfully. 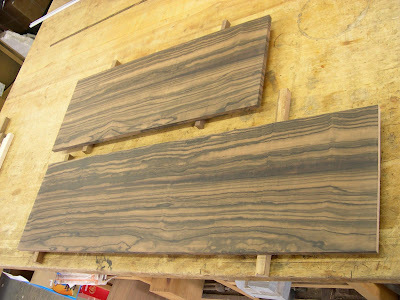 Here are some observations about hide glue and hammer veneering in general. First - get Rob’s DVD. The first disk alone is well worth the cost of admission. Rob has a very no-nonsense manner about him and watching him work is an incredible education. He works methodically and is very good at explaining everything that is going on - including what to do with cracks in the veneer or if they develop part way through the process. I thoroughly enjoyed the DVD. Hot hide glue does not smell bad at all. Getting the correct consistency of the glue is very important. As I was mixing my first few batches I was running back and forth from the house to re-watch the DVD to get a sense of the consistency of the glue running off Rob’s brush. It was only after I stopped running back and forth that I realized I could have just brought my laptop into the shop. 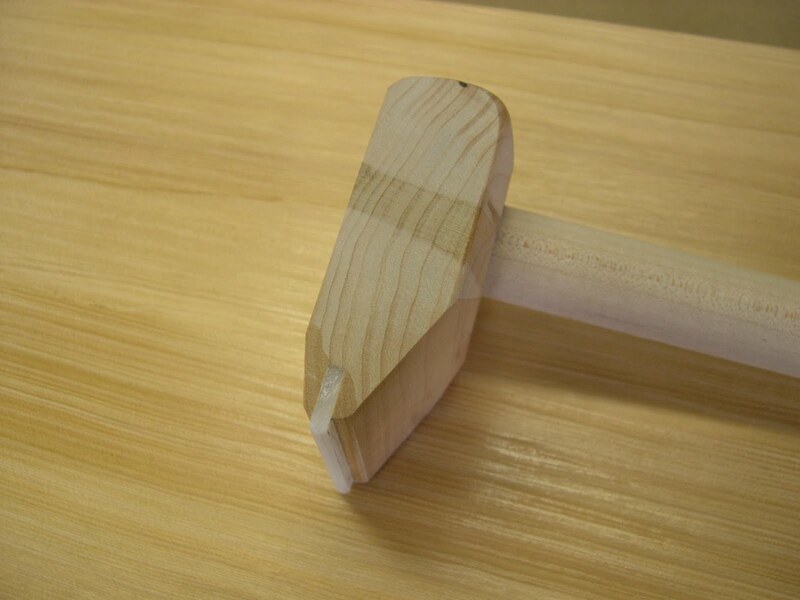 Making a veneer hammer is really easy compared to making planes. Working with hide glue is really quite pleasant and I will absolutely try to switch over as time permits. As my friend Mark said as he handed me the bucket of ground hide glue, “be careful... you will find yourself just gluing stuff together just because you can”. He was right - I was gluing all sorts of stuff to see how it bonded. It was very impressive. In Rob’s DVD, he often lightly sprays the veneer to keep it from curling. As I was working with the Macassar - I was having to apply at least 3 times more water to keep the veneer flat. But... it did work and the veneer went down very well. I should also mention that this veneer was very thick - it was not the typical “spit-through” veneer that is available now. I am sure that increased the need for more water. 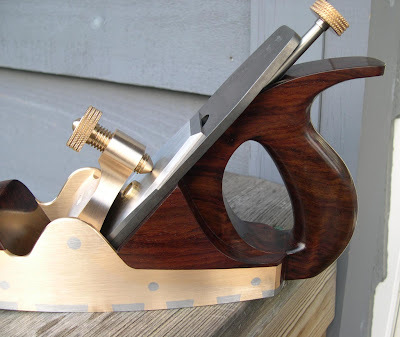 You can successfully plane veneer if your planes are set for a light cut. I would like to offer my deepest thanks to Rob Millard for all his email correspondence during this first adventure with hot hide glue. He was very generous with his time and advise. If you have any interest in working with hide glue but are not quite sure where to start - watch his youTube video as a primer and then pick-up one of his DVDs. That will get you well on your way. Every time I visit your site I walk away saying, "You know, if I tried, I could do that too." Which translates to, "Man, that Konrad sure makes it sound easy..."
Perhaps you could share a bit more about this claim that modern adhesives will not last more than two generations. The only glue that would reliably break down in my awareness is contact cement. Are you saying that epoxies and PVA glues will also break down? Can you provide your source for this information? I had a pleasant experience with hide glue. However, I still hate the smell. My dog went crazy when I was preparing it. That Macassar veneer is sick! 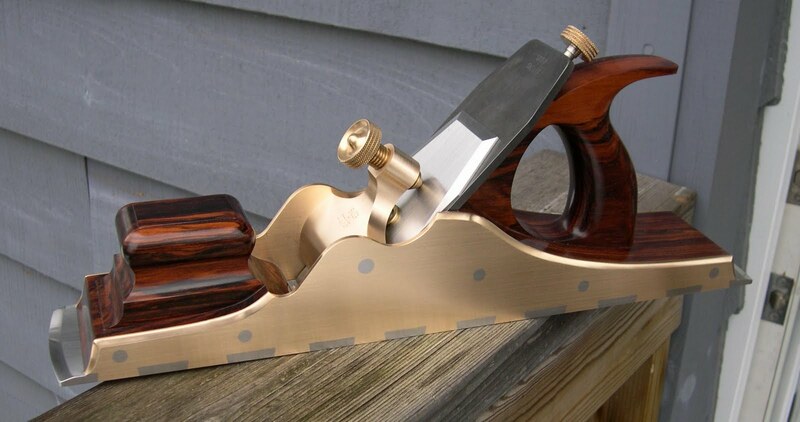 I'm always impressed at the wood you come up with. I've been similarly taken with hide glue and hammer veneering. For small to medium sized surfaces, it can't be beat. Yet another great tool at your disposal. Glad to see the project worked out so well. My interpretation of the lament that "[modern] furniture will only last 2 generations" is that modern adhesives are so good that woodworkers are relying on them instead of depending on solid joinery to hold their projects together. This may be true is some cases, but I doubt its the norm. Of course, some are doing cutting edge stuff that simply wouldn't be possible with older glues (where there's an envelope, push it ...). I doubt there's any solid evidence that modern glues suddenly and spontaneously deteriorate after 60 years. Thanks for all the links. I am working my way through them. I was aware of the different gram strengths but thanks for the reminder - I should have mentioned it in the post. Thanks for the book suggestion. I will pick it up. Thanks Albert. Glad I made it look easy. It was not that bad really... but as with all things, there is a learning curve. I think the biggest one was the glue consistency. I have spoken with my friend in Oregon and he is hopefully going to jump in with a few additional comments. One addition is that hide glue is revearsable whereas the other glues are not. Some totally not, and some with varying degrees of success. If any joint fails on a piece of furniture, or if a lamination de-laminates, there is nothing that can be done about it. The rest of the piece could not be taken apart to repair the original failed joint. With hide glue, this is possible. Anyway - hopefully he will jump in and clarify or correct my comments. The Macassar is pretty spectacular. It was one of those things I saw a long time ago and had to buy some. Finds like that only encourage me to keep buying wood to put away for a rainy day. Excellent point about adhesives being relied upon instead of solid joinery. I am not sure that modern glues will spontaneously deteriorate - but the issue may have more to do with what can be done once they do. As I mentioned in a previous comment - I am hoping my friend will jump in with additional comments and clarification. I have the same question about the "2 generations" failures. I work here, BespokeMinneaopolis.com, and we veneer onto MDF for its flatness and stability, i.e., no grain movement whatsoever. We use Titebond's cold press glue in a glue press for at least 45 minutes. The 'if the joint fails" it's impossible to disassemble and repair' is true, but is this because of the adhesive used. (But I remain convinced that chairs should only be glued up with hide glue, though this is a special case, stresses from leaning back on the legs, etc.) Does the conservator recommend hide glue for edge gluing boards...? I suspect not. On the other hand, I thinik hide glue is wonderful for use on veneers, especially as it can be applied without the use of presses, vacuum or otherwise. I can't speak personally to the 2 generation failure thing, but I do remember hearing Adam Cherubini mention somewhere that there are museum conservators who are finally seeing some of the early PVA assembled furniture. The way he tells it, these pieces typically don't restore very well. I'll have to send him an email one of these days to get more details. He also said that some of the (historically) recent pieces segmented turning that's being held together with Cyanoacrylate is literally falling apart... I guess super-glue has a life-span, too. I must agree with the others... you do things so perfectly and I am inspired to work on my own projects too. I must say this is one of the best website that I have ever encountered today...I have bookmarked it and come back again to check on more readings. JW - thanks for the link to Adam's comment. More to think about! Welcome here - glad you are enjoying it. I am still waiting to hear back from my source for further clarification. The last think I want to do is put words in his mouth. I will report back once I have something to report. Thanks for your patience. I worked in a furniture restoration shop for a long time and had plenty of experience repairing furniture that had been repaired with white or yellow glue. The problem is, that the glue has to be removed before it can be glued back together. Unlike hide glue, yellow glue won't stick to itself. As it can't be disolved like hide glue, it has to be scraped off. This results in some wood being removed - which results in a loose joint. That has to be addressed. So, if veneer that has been put down with yellow glue loosens, there is no way to glue it back down. If you want to be sure your furniture will be around for generations, use hide glue. Also, I have used it for many edge joints on table tops, ect. and never had a problem. I do use the cold liquid glue for these however, as there is not enough open time in the hot glue for my comfort. Hide glue in any form will give you a joint that is stronger than the wood, that's all that counts. As the unnamed Oregonian who started this, let's see if I can say what I meant to;-). In conversation a couple years back with a couple of very experienced conservator/restorer types, there was the rueful opinion that much of the best studio furniture being made today--including many gorgeous pieces by top craftspeople--would have a relatively short service life, perhaps a generation or two if that. 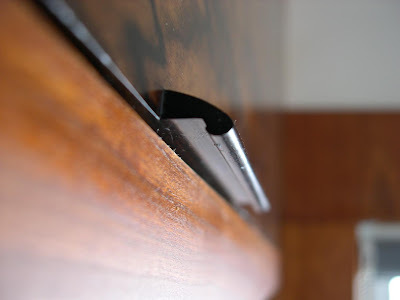 The principal reason mentioned was the non-reversibility and poor repairability of modern adhesives, although mediocre joinery, disregard for wood movement and/or likely use/abuse, and poor finish choices obviously feature in some work (even by hotshots). A typical case is where a failed joint requires disassembly of other intact joints...but disassembly of the intact joints made with modern non-reversible adhesives virtually destroys them. Sort of like trying to work on a car engine held together with welds instead of bolts. A Catch-22 ensues: if the piece is not repaired (e.g. due to risk, difficulty, or high cost) it deteriorates even more quickly or is simply retired, but if it is repaired (along with the other things broken in the course of repair) the piece is weakened, often cosmetically damaged, and similarly headed for early neglect and banishment. For the record: no one predicted that the adhesives will widely fail in one or two generations, that was my lack of clarity w/Konrad. They did say that all adhesives fail eventually, and that the jury is not in yet on the current crop. It IS common for furniture to need repair w/in a generation, frequently the most used and stressed part, and thereby create an ongoing problem if the repair is weaker than original and also harms supporting areas. One conservator suggested glueless mechanical joints could well give the longest service if designed properly, from classical chinese furniture to slabs of redwood joined with titanium bolts. Another suggested that obsessing over (furniture) immortality is pointless, the impermanence of all things having been established for millennia. Yet another opined that toilets (and other sturdy fired ceramics) may be our longest lived artifacts. Most pointed out that while our best efforts will help, longevity is largely in the hands of the owners, and that museums are well stocked with items that got little use and unusually benign care. In support of benign care, Don Williams of the Smithsonian has written a book called Saving Stuff: how to care for and preserve your collectibles, heirlooms, and other prize possessions. After digesting all this, I considered simply meditating on a mountainside for the remainder of my life. Eventually I realized that this wouldn't pay for chocolate or pizza, and that I still liked making useful and beautiful things--though that may not pay for them either:-(. 1) Design with structure and joinery that will endure likely use and abuse, with a generous allowance for wood movement, and with provision for what's likely to need repair over time. 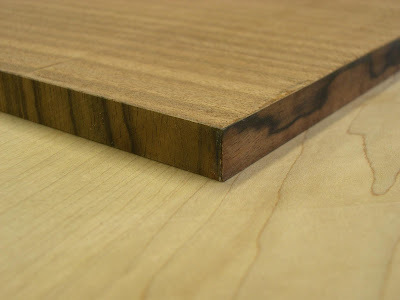 2) Fit joints well, and fasten mechanically or with adhesive that can be repaired (which will vary with application: hide glue makes great sense where disassembly and cleaning are a challenge, but use whatever you like to join a plank table top (w/out breadboards), where a failure can just be resawn, jointed, and glued). 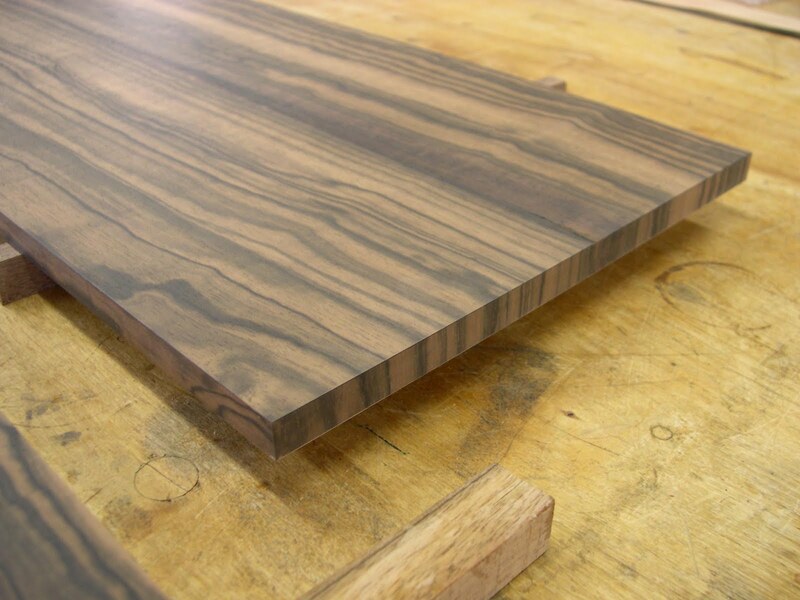 3) Use finishes that slow moisture swings in wood and are reasonable to repair and refinish. I also try to make work that is lovely and personal so someone wants to take care of it, and write notes (about adhesives, finish, etc.) where a repairman should find them. In general conservators and restorers I encountered liked hide glue and shellac and intensely disliked polyurethane glue or finish. As they say on the long trails, hike your own hike! I have had the same point and shoot camera for almost 10 years now. 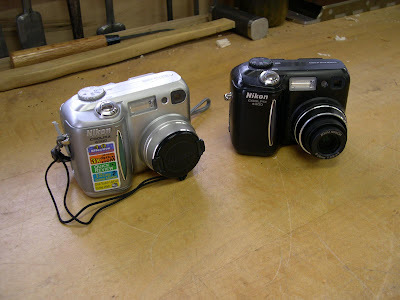 It is a great little camera - it has taken all the photos on this blog. It is a true point and shoot camera in that I do nothing with any of the settings of the camera other than turn the flash off and toggle between the macro feature for close up work and the “normal” picture mode. When I first got the camera, I changed some of the settings - the image quality, the image size etc. but nothing too involved. After I take a shot, I plug the camera into my Mac, turn on the camera, the camera pops up on the desktop and I copy the images onto the desktop. I delete the images from the camera and unplug it. I open the images and crop them if I need to and label them accordingly. That is it. No muss - no fuss. Easy-peasy. The camera is a Nikon Coolpix 4300 and is very basic. About 2 weeks before Christmas, the camera started to die. The mechanism that moves the 3X zoom lens in and out was making some sad noises. I knew its days were numbered. I managed to squeeze a few more shots out of it, but I knew it was time to replace it. So I jumped in the car and drove to Henry’s to get a new camera. I should back up a bit. Ten years ago when I bought this camera I went into our local Henry’s in Toronto. I had a plane along with me and walked in and told the sales person that I was committed to buying a camera today as long as I would be able to photograph this object (the plane) and see how the images looked in Photoshop. No problem he said, and proceeded to show me several cameras. The Nikon Coolpix 4300 was the clear winner by a long shot. Fast-forward to a month ago and I went to our local Henry’s to repeat the process. No such luck. Apparently, they did not have Photoshop on any of the computers in their store. I explained the situation - the camera that I was using and that I was looking to replace it. The sales person showed me a few and said the Nikon P100 was the closest evolution to the Coolpix 4300... but it was “much, much better”. So I bought it - all pleased as punch that my camera issue was really a non-issue. Everything about it was pretty familiar - there were a few more bells and whistles - but the interface felt similar. It was the white balance that concerned me the most. I was working on a plane at the time and did what I normally do throughout the day - take photos as I go and send the customer a mid-day report on what I had completed. 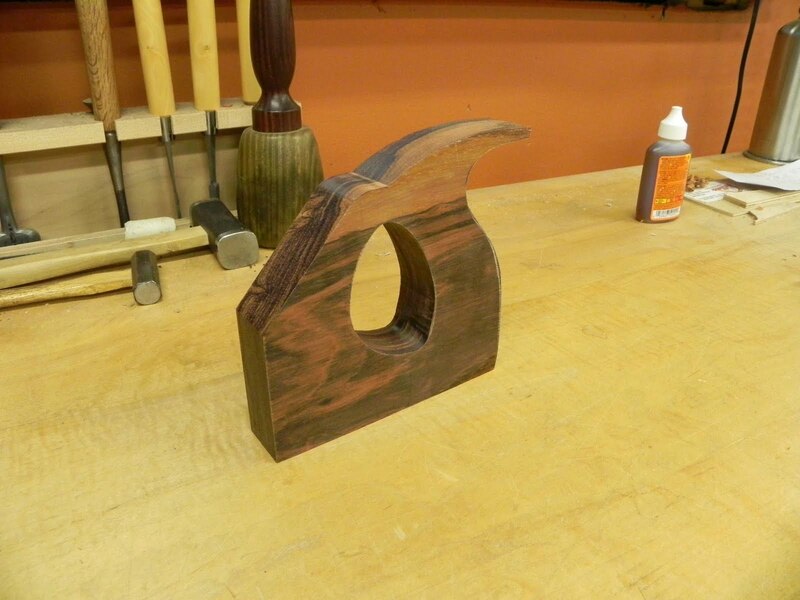 Notice how the color of the wood is kinda wonky while other colors like the Record blue vise are pretty good. For comparison - here is a photo of another plane taken with the old camera. Both photos were taken with planes in the same vises. The blues are ok, but the clarity and accuracy of the wood is very different. I spent about 20 minutes color correcting the P100 photos and realized there was no way I was going to spend this amount of time monkeying around. So I decided to return the camera. As I was driving home, it occurred to me that I may be able to find a used 4300 on Ebay. When I got home I checked, and to my delight there were half a dozen to choose from. The new to me camera arrived on December 24th. I was like a kid would be on the next morning - I tore into that package as fast as I could. I ran out into the shop, took a few photos and ran back to the office to see how they looked. Part of me was a little worried that I had totally lucked out on my first 4300 - that it was a photographic anomaly. Thankfully - the photos were just as good. I was elated (and very relieved). I quickly turned right around and bought a second 4300 from Ebay ($60.75 delivered) so now I have a spare. The back-up camera is just as good, so I should be covered for the next 5 years at least. Fingers crossed. I'm surprised the salesman told you the P100 was way better than your old camera. From all that I have heard, as well as seen with my own eyes, the P100 is one of the worst cameras Nikon has ever made, at least in the digital age. Yeah - it was a pretty disappointing experience to say the least. At least part of the problem with the P100 looks/sounds like a color balance problem, which could be rectified with some work on the white balance. For less than $10, you can get a small, hard plastic color/white reference card that you include in the first photo in a series, say, under certain lighting conditions. Then in a photo-editing application, you balance the color by pointing to the white reference card. It's fairly straightforward, and not a lot of hassle. That said: we owned a Nikon 4300 for a long time, too, and they are great cameras. If you're satisfied with it, there's no reason to switch (or "upgrade"). My photographer friend stopped in with her D70 and D700 and we compared settings, white balance and a rather long list of other possible variations to get what I was after. At the end of the day, this kept it from being simple and would require a lot of work on my part. I was looking for a very simple point and shoot camera that was able to capture what I was seeing. The 4300 is by no means a professional camera, but it does take pretty accurate photos with minimal effort. I would certainly consider a D70 or D90, but there was a lot more work involved in getting photos. The 4300 is so basic, it does not really have a white balance to set. Makes me almost wish I could still run film through my F2! Bought one for my office as our camera for samples: found it utterly horrid to work with, took it back to Henry's the next day, bought a Canon T2i. but utterly painless to work with. My "home" camera is an old Canon S5 which works well for macro work and photos of my wood turning: one shot white balance and then perfect color. No, I have not used this camera for several years now. Moved on to a GH3 and a M9. Pretty significant upgrades, but well worth it. Nothing like waiting until the last minute. 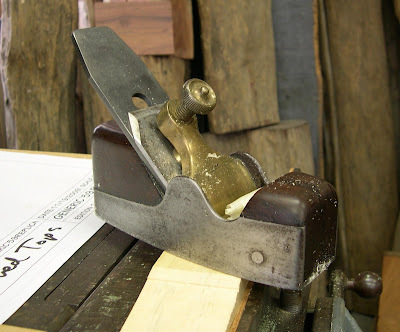 I filed the mouth on this 16-1/2" A1 panel plane on December 31st 2010.It is filled with mystery Rosewood. And... I think the mystery of Mystery Rosewood has been solved. 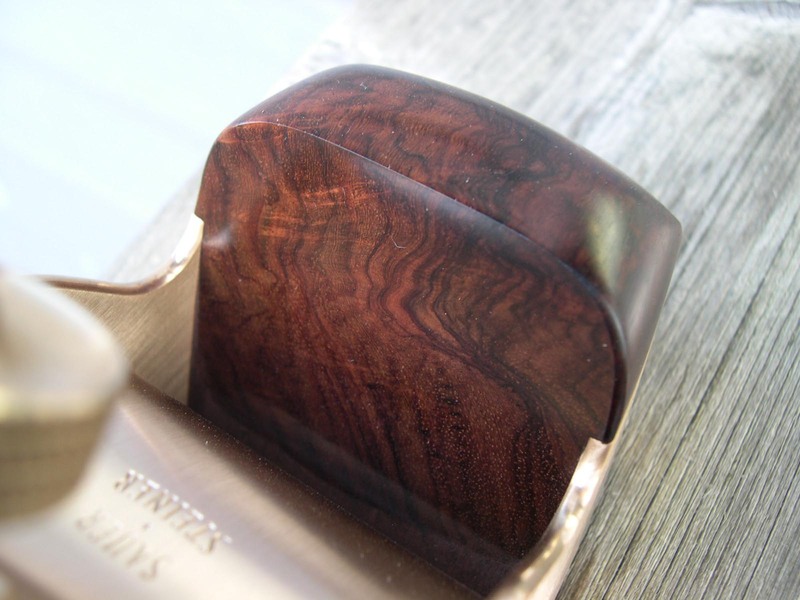 I received an email from a very skilled guitar maker in England who was quite certain he knew what the Mystery Rosewood was. Madagascar Rosewood (Dalbergia Baronii). I have seen Dalbergia Baronii many times and it does not look anything like my Mystery Rosewood. 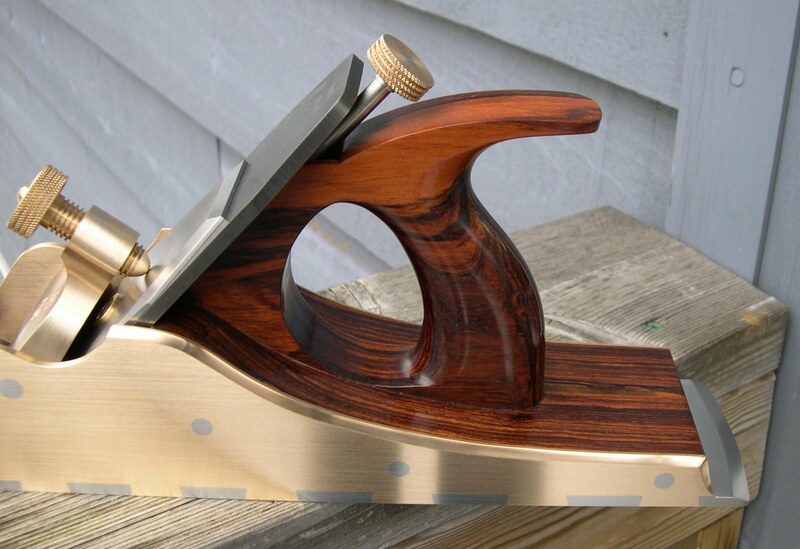 He assured me that it was and that I was using what he called “ridiculous premium grade Madagascar Rosewood ”. After a few back and forth emails, some photos and the shipping of a small sample - I am quite certain that the Dalbergia Baronii he is using is the same stuff that I have been calling Mystery Rosewood. It seems strangely fitting that on this second last Mystery Rosewood filled plane - it is finally identified. Thanks Anthony for helping with this. This A5 was a surprise Christmas gift. It was all I could do to keep from posting these photos. 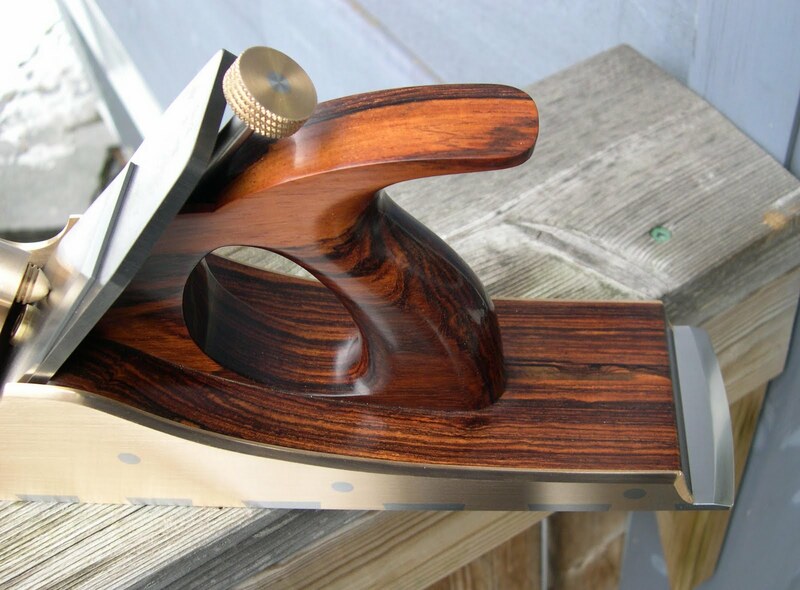 This plane is infilled with some stunning East Indian Rosewood. It was an a infill set that I had roughed out in 2004. I knew it would make for an incredible plane. Here are a bunch of photos. The sun was streaming in when I was filing the mouth on the A5. I could not resist taking a quick photo of the grain. 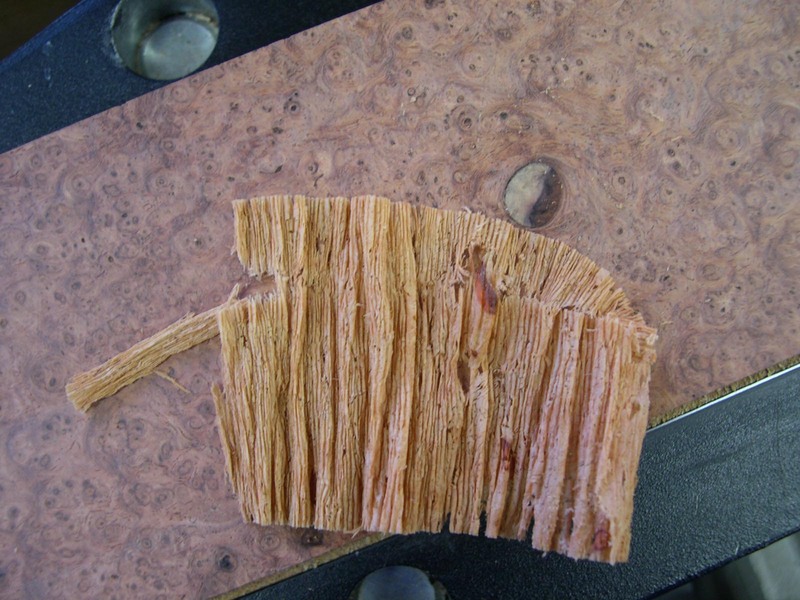 An Amboyna burl test shaving from the above A5. Jill and I found the perfect piece of artwork for above our fireplace. A dear friend of ours, Noriko Maeda, is a phenomenal Japanese calligrapher. We have always loved her work (take a moment and check it out). Noriko stopped in just before Christmas to show us a few of her pieces. This one stood out right away. It is curious that it is based on the Japanese character for water. A fitting home above the fireplace I think. The above photo has not been messed with in Photoshop, and I could not help but think that the strange purple glow inside the fire is someone traveling by floo powder. Lucas suggested this may be how Santa travels. Over the holidays, I was re-introduced to an old friend. This is the very first infill plane I owned - an un-handled Spiers coffin smoother. For all intents and purposes - this is the plane that started it all. It has been living in a small display cabinet in the shop. The iron it came with (which was not the original iron) was just about done - there was only 3/4" in front of the slot. I had lapped the sole 12 years ago (and noticed that I had not done a particularly good job of it) so I decided to do a little work on it. It really needed a new blade. This was a pretty big deal for me. It felt a little weird putting one of my blades in a Spiers plane. The new blade was a little thicker which meant I had to file the mouth open a few thousandths of an inch. Filing the mouth felt strange too - I was a little nervous despite having done this hundreds of times on my own planes. 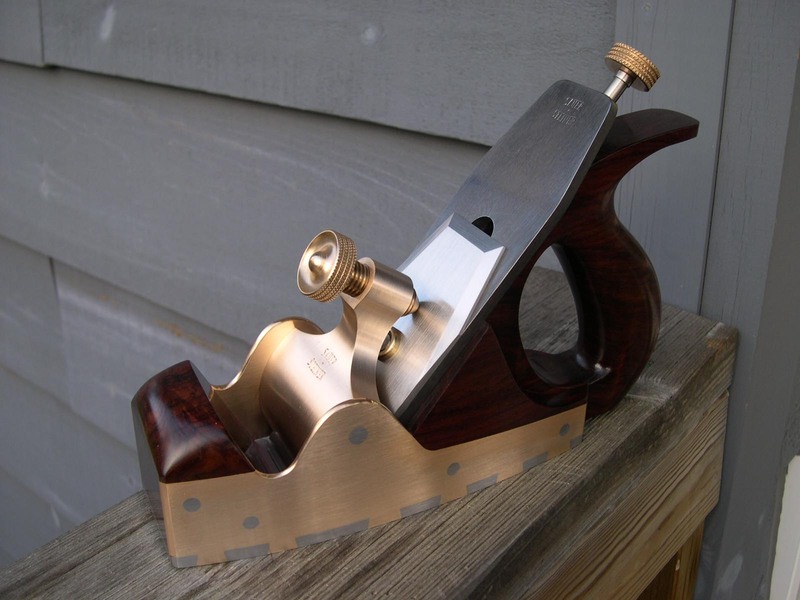 This is the only plane I have with a 45 degree bed angle and I have to say, it is kinda fun using it again. 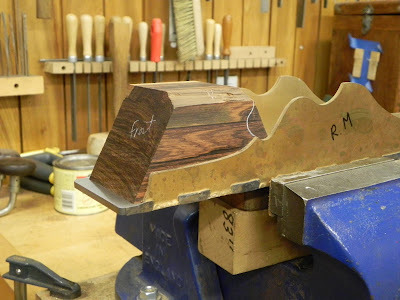 I have been working with Basswood over the last few weeks (much more on this later:) and have been enjoying the lower bed angle in this easy to plane wood. And as Garrett Hack says - planing Basswood makes anyone feel like a hero! I am going to stop this post here. I have several more new topics to introduce in the next few weeks. My first experiences with hide glue, my camera nightmares and building a 59LP. Konrad, I know how you feel. I have a small smoother made by James Krenov. A few weeks ago i added an insert to tighten up the throat. Although i have done this many times, i was a little nervous as i approached the plane with the trim router. If Spiers were around to inspect it, I'm sure he'd tell you that he would be proud to have one of your blades riding around in his plane! Thanks for this note. You experienced the same thing I did with your Krenov plane. I would have a similar feeling about working on one of James's planes as well. Thanks Jonathan. It is that very connection to history that makes the whole thing feel weird. But now that I have done it - it does feel pretty cool having a blade in his plane. I don't know which is more beautiful, they all seem to be wonderful expressions of your skill with and love for the materials you work with! Love the fireplace and artwork! The fireplace exudes huge character, beautiful. Just a question on the floor. How is the humidity in your home and has it had any noticable effect on your floor? Thanks for your kind comments. I noticed you have posted on a few early blog entries as well. Thanks for all the comments. Thankfully - the floor had not moved at all. Everything is still very tight and there are no squeaks or pops when we walk on it. We are in an un-air conditioned house, so this past summer the humidity was up around 80% on bad days. This winter has been quite cold and dry - I suspect the humidity is really low around 15%. That is a pretty amazing swing in humidity and I am all the more thankful that the flooring was very good quality quarter sawn material. Yep thats what I thought, whilst my home is not of the same era as yours it gets the same swings in humidity. We primarily use wood for heat and tend to dislike air conditioning. I think the fact that you used QS is probably helping in your case. We are laying 3/4" engineered european made 7" American black walnut, lengths are between 6ft and 8ft. Its high quality flooring which you rarely see at the flooring shops here in Ontario. I have spoken to a few other folks who have installed in homes without any humidity control and they all tend to say the same, that is it really hasn't affected the floor all that much. Currently there is 5/8" ply, I'm going to glue and screw another layer of 3/8" to firm it up a little more. Then the engineered boards. I'm going to add a decretive border to the dining room, an idea I got from your floor. I really like the way your border turned out and am hoping to achieve a similar result using different tones. I really appreciate your effort to document the work you have done. It helps a lot to see how others go about it and your documentation is terrific.